Tray Player is an app that allows you to play MP3 files on your computer. It quickly sorts through the files and folders that you Drag & Drop into the app, and plays only audio files. Also, Tray Player does not take up any valuable space on your screen! It shows up in your status menu (the bar on top of the screen) as well as in the dock, a.k.a. the task bar on the bottom. Tray Player’s controls resemble those of a hand-held MP3 player: Play, Pause, Rewind, Fast-forward. 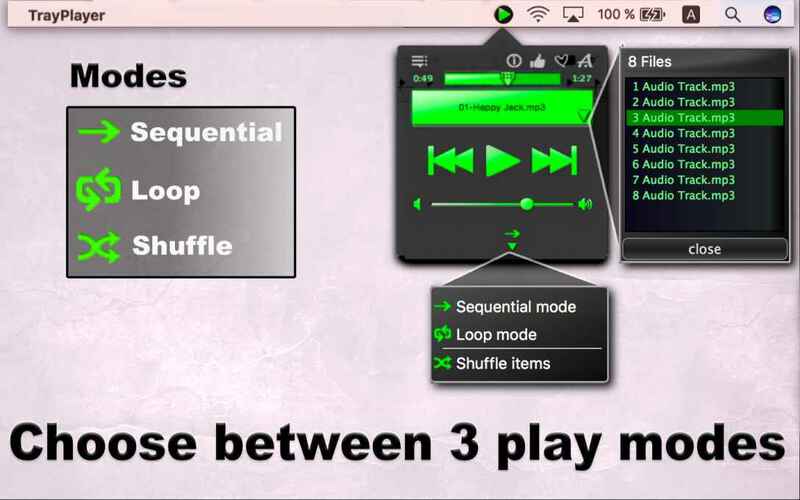 You can select to play your tracks in order, on the loop, or shuffle them. The player displays the name of the track currently playing, and you can skip to the exact spot in this track. You can also see the list of your tracks and add new files to that list any time you want. In addition to MP3 files, Tray Player supports the following formats: MP3, M4A, WAV, AIFF, CAF, MP4, MP2, MP1, AAC, AU, M4R, TS, MOV, QT, MPG, 3G2, VOB. Drag & Drop your audio files into one of the 3 locations: the app window, the app icon in the status menu, or the one in the dock, choose a play mode and hit Play! It really is that easy. Download it today! Hello and welcome to Tray Player! 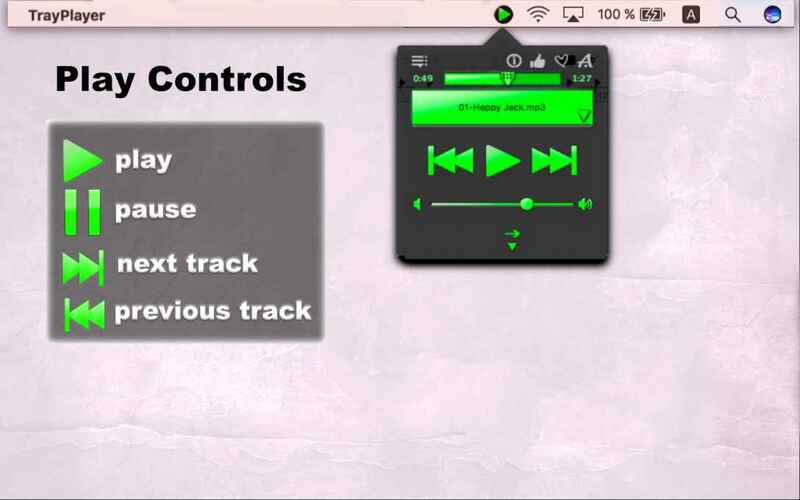 Tray Player is an app that allows you to play audio files on your computer. It shows up in your status menu (the bar on top of the screen) as well as in the dock, a.k.a. the task bar on the bottom. Tray Player’s controls resemble those of a hand-held MP3 player: Play, Pause, Previous, Next. You can feed it any files and folders. Just Drag & Drop your audio files into one of the 3 locations: the app window, the app icon in the status menu, or the one in the dock .It quickly sorts through the files and folders that you Drag & Drop into the app, and plays only audio files. Let’s try to feed it files that don’t contain audio. See, it doesn’t add them. You can select to play your tracks in order, on the loop, or shuffle them. Hit Play! If you want to pause the music, just click on one of the icons. Or hit Play again. The player displays the name of the track currently playing, and you can skip to the exact spot in this track. You can also see the list of your tracks and add new files to that list any time you want. See how easy it is? Download Tray Player now!